Our 5 Day Murchison Falls and Budongo chimp trekking safari is for those that have enough time to explore Murchison Falls for game viewing, boat cruises and chimp trekking. Murchison Falls located in the north west part of Uganda is the largest conservation area at 3840. The park is traversed by the mighty River Nile and is one of the exciting National Park to visit during your Uganda safari. Murchison Falls National Park has several vegetation types ranging from swamps, tropical rainforests of Budongo, Savannah woodland and grassland that are home to a variety of wildlife that include chimpanzees in Budongo forest, lions, hyenas, buffaloes, leopards, hippos, crocodiles, the rare shoebill stock, small primates and other savannah, marine and forest species. Visitors to Murchison Falls National Park should not miss out on spectacular game drives and boat cruises to the base of the falls and delta. One may need 2 to 4 days to explore Murchison Falls National Park. Day 01: Drive to Murchison Falls National Park via Zziwa Rhino Sanctuary and top of the falls. Day 02: Morning game drive and afternoon boat cruise to the base of the falls. You will be met by your guide of the day at your hotel for a short briefing about your 5 Day Murchison Falls and budongo chimp trekking safari. safari and then drive 5-6 hours to Murchison Falls National Park. 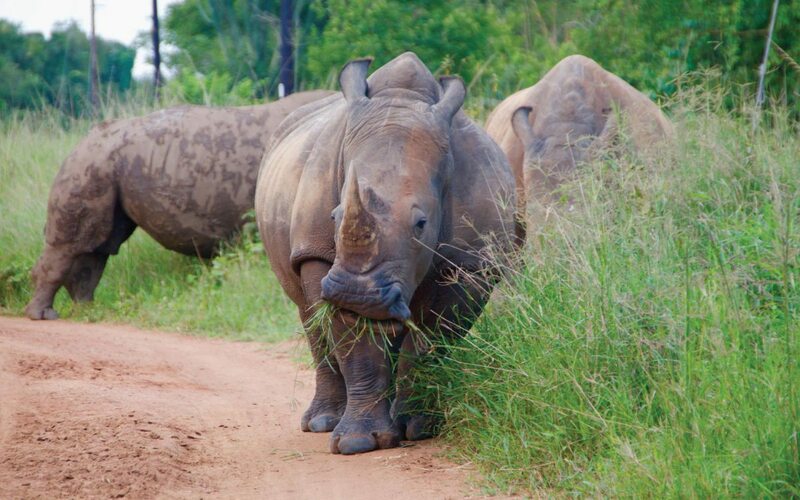 The journey will take you to Zziwa Rhino Sanctuary to track the white Rhinos at the sanctuary. Rhinos were poached to extinction during the 1970’s but the government and other non-government organization are trying to restore them back. From Ziwa Rhino sanctuary, you will drive to Masindi for lunch before proceeding to Murchison Falls National Park with a visit to the top of the falls. This will be evening so you will transfer to your overnight accommodation. After breakfast, you will cross the ferry to the northern part of part of Murchison Falls National Park for your early morning game drive. This northern part of Murchison Falls National Park known as Paraa rich in wild game that include lions, buffaloes, elephants, several antelopes, leopards and so much more. The delta region is also very rich with water animals such as hippos, crocodiles and the rare shoebill stock. At Murchison Falls National Park, it is nature that gives so the fact that wild animals graze and move naturally, seeing any animal will depend on your luck of the day. Afterword’s, you will drive back to your lodge for lunch and then head for the afternoon boat cruise to the base of the falls. This boat cruise to the base of the falls is seen as the highlight of all activities at Murchison Falls National Park since many water and land animals can be sighted. Expect to see lots of Buffaloes, elephants, crocodiles, many water birds as you cruise up stream to the base of the falls where water squeezes itself into a narrow gorge to later explode as it flows down words. Return to the lodge for overnight. After breakfast, you will be picked up by your boat to go to the delta area of Murchison Falls National Park. While this boat cruise is not popular with tourists visiting Murchison Falls National Park, it offers a chance to see lots of wildlife species that include buffaloes, elephants, crocodiles, hippos and the rare shoebill stock. You will also observe the Nile reducing speed as it deposits waste before entering lake Albert. Return back to the lodge for lunch and then prepare for your evening game drive to look for animals you could have missed on the first game drive. Overnight as below. After your breakfast, you will drive for about 2 hours southward to Budongo Forest where you will spend one night. At Budongo forest, you will do chimpanzee trekking either in the morning or afternoon depending on your choice and availability of chimpanzee permits. Before your chimpanzee trek, you will be briefed by your ranger guide of the day about the dos and don’ts while with chimpanzees and then set off to the forest to look for our closest relatives. The walk will also expose you to other primates, plants and shrubs in this vast forest. After your chimpanzee trek, you will return to the lodge for overnight. After breakfast, you will drive back to Kampala or Entebbe international Airport for your departure flight out.